Provide comfort for the family of Teddy Ted Boyd with a meaningful gesture of sympathy. In loving memory of Teddy (Ted) Newton Boyd of Garson, who passed away just shy of his 89th birthday, Sunday, March 17, 2019 at Health Sciences North. Ted was born May 25, 1930, the youngest of 7 children of the late Lillian and Alexander Boyd of Capreol. Survived by the love of his life, Marion (Duncan) Boyd. They were married 68 years. Survived by his 6 children, Douglas, Thomas (Belinda), Darcy (Aida), Scott (Ellie), Edward (Mandy), Janet (John) and grandchildren, Tarron, Alycia, Thomas, Mackenzie, Andrew and Tyler. He retired from Falconbridge Nickel Mines after 36 years in their accounting department. 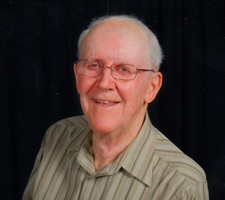 He was an active member of the Nickel Centre community. He volunteered as manager, Garson Falcons midget hockey team, Meals on Wheels, and as Trinity United Church treasurer. He enjoyed golf, curling, bowling but loved the socializing more. He was a great conversationalist. He spent 17 wonderful active years in Lakeland, Florida escaping the chilly Sudbury winters. A long time member of the Nickel Centre Seniors. He was a great friend and mentor. Always willing to help. He was a beloved brother, incredible grandfather, loving husband and best Dad. He was a man who loved his family dearly,...our hero. He will be sadly missed. In lieu of flowers, donations to the Lung Association or the Kidney Foundation would be greatly appreciated. For donations or messages of condolence, www.lougheed.org. For those unable to attend the service in person, it will be available to view at www.livememorialservices.com/home/services. To send flowers in memory of Teddy Ted Newton Boyd (Boyd), please visit our Heartfelt Sympathies Store. with interment in the St. John Cemetery. Consider providing a gift of comfort for the family of Teddy Ted Boyd by sending flowers. We encourage you to share your most beloved memories of Teddy Ted here, so that the family and other loved ones can always see it. You can upload cherished photographs, or share your favorite stories, and can even comment on those shared by others. He will be deeply missed -- a wonderful father and father-in-law. Dad, I am going to miss you. You were the best father a son could ever hope for. I am so sorry to hear about Ted. I have fond memories of him from past church days and working together on the council. My deepest condolences. Just heard from my friend that my uncle had died. I am so sorry for his loving family. I will never forget the great times we shared with Ted and his lovely wife Marion. The summers out at Kukagami Lake & in the winters in Lakeland Florida, always enjoyable with laughs all around. Ted was a very special person and I was lucky to have known him. God Bless!